How are you doing with Meal Planning friends!? Can I make it easier on you next week!? I'm on a roll with meal planning, I've stuck to it now for TWO whole weeks (slow clap). Hey, it's only two weeks, but you gotta start somewhere! 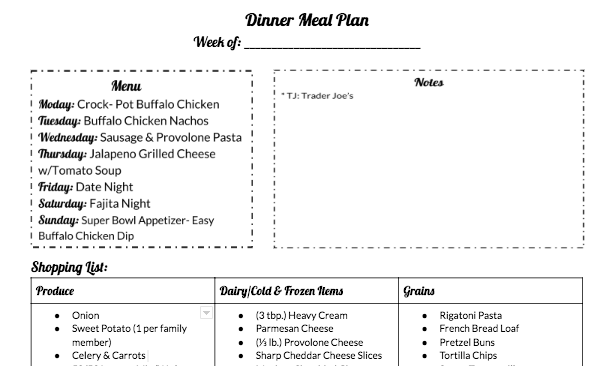 I'm ready to share Week 2 of my meal plan with printable grocery list, let me know if you tried any of the recipes from last week! The enchilada chili was DELICIOUS and seriously took less then 15 minutes to put together, top with tortilla chips, cheddar cheese and some hot sauce, yum! 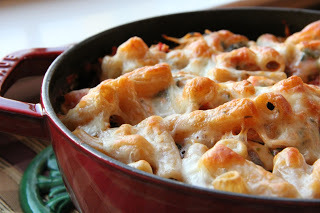 You can grab that recipe in this post: Meal Plan Week 1. 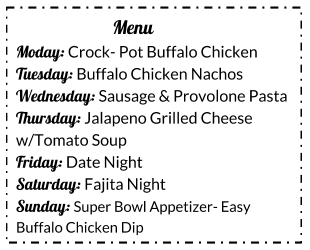 If you missed last week, let me give you a quick run down on what it means to "meal-plan" in the Snyder house! Just because we meal plan does not mean things are about to get FANCY over here, we like to stick with the basics! I also try to think of meals that I can "un-do" for my little ladies, which means I don't need to think of a little something extra for them. My goal is to add in one or two new recipes each week and we like to treat ourselves to take-out once or twice on the weekends. Monday: Crock- Pot Buffalo Chicken, This is a favorite over at our house, Scott and I can make a ton of this in the crock-pot one day and think of a million different ways to use it! My favorite is to put it on top of a sweet potato with mozzarella and a drizzle of ranch dressing. It's also delicious on a Pretzel Bun, topped with pepper jack cheese and a little ranch dressing too! It's SO easy to make using either your Crock Pot or Insta Pot, literally put in the boneless chicken, pour in a bottle of Frank's red hot and optional, add in a Hidden Valley dry ranch packet for a little extra flavor! I know a few Whole 30 recipes omit the ranch packet and it still tastes great! Little Ladies: This will obviously be way too spicy for the girls, my girls love breakfast food and this would be a good night to do "breakfast for dinner," it doesn't take me long to scramble a few eggs and cook some bacon! They also love greek yogurt with fruit as a side. Tuesday: Sheet Pan Buffalo Chicken Nachos, Using the leftover buffalo chicken from the night before, layer a baking sheet with tortilla chips, a layer of buffalo chicken, Mexican blend shredded cheese, pico, guac, whatever you prefer! Mom Hack: I always try to think of a way to use the same ingredients for a few meals in one week, it's a great way to save a little money and a lot of time! Little Ladies: Instead of topping the girls nachos with buffalo chicken, I'll defrost frozen taco meat, another Mom hack, my girls LOVE taco meat and could eat it multiple times a week, I always try to make a huge batch and freeze some for a night like this. Another easy dinner would be a cheese quesadilla topped with wholly guacamole. 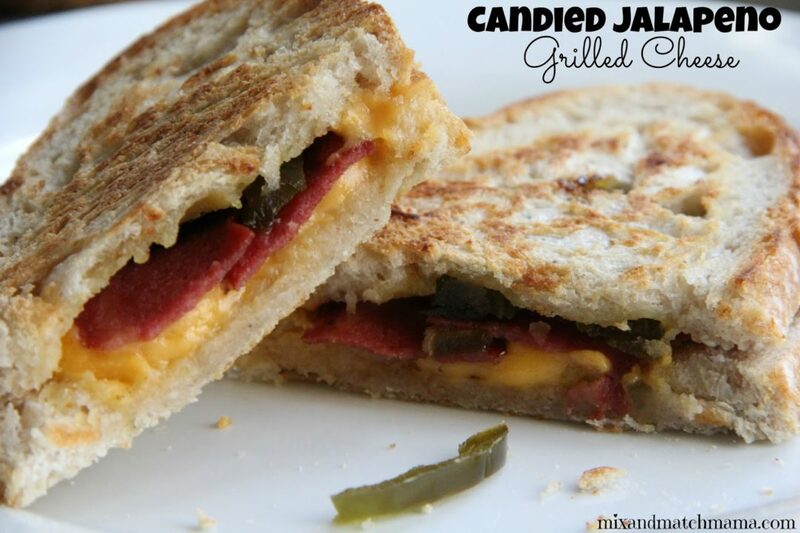 Thursday: Jalapeño Grilled Cheese w/Tomato Soup, my second new recipe for the week, this looks really easy, fast and delicious! Bonus, the girls can have plain grilled cheese and we all love the pre-made tomato soup from Costco, if you haven't tried it yet, make sure to grab it on your next Costco run! Friday: Date Night or Take-Out, it has been a MINUTE since Scott and I escaped for a date night, we are SO looking forward to a delicious meal and uninterrupted conversation! Saturday: Fajita Night, I'm all about the "easy" button, for quick and delicious fajitas, grab the crane asada from Trader Joe's, along with their frozen fajita veggie mix, guiltless guacamole and pico de gallo! You can grill or bake the carne asada and everything else is ready in minutes. Quick, minimal clean-up and so yummy! Sunday: Super Bowl Appetizer- Easy Buffalo Chicken Dip, using the same ingredients I used earlier in the week, I'm going to make a buffalo chicken dip for a Super Bowl party we are attending! I'm going to slow cook new chicken the night before and then combine everything the day of the party, there are a ton of similar recipes on Pinterest, but I'm going to try this one: Simple Buffalo Chicken Dip. I'm planning on bringing tortilla chips, celery and carrots to dip and I'm thinking it's going to be a crowd favorite! For more Super Bowl recipes, check-out my Pinterest Board!